Four Synergistic Products Providing The Ultimate Immune Support System Extra Strength that helps heal and rejuvenate while minimizing herxheimer reactions. A compromised immune system can result in weakened defense against pathogens with consequences of poor health. Whereas a supported immune system is key to regaining and retaining strength, energy and optimal health. The Ultimate Immune Support System optimizes the body’s natural immune response, a healthy inflammatory response and the ability to neutralize oxidative stress. • Advanced Cellular Silver provides 200 parts per million (PPM) 99.99% pure silver colloid hydrosol, proven one million times more effective than other silver brands. • ACZ Nano Zeolite Extra Strength (combined with ACS 200 Silver Extra Strength) has been shown in multiple case studies to effectively increase urinary output of toxins. Directions for Use: Take 12 sprays of each formula twice daily for heightened support, or 6 sprays twice daily for maintenance. The leading silver-based supplement in multiple independent comparison studies, ACS 200 Extra Strength achieves 99.9999% (complete) kill against Borrelia burgdorferi, Powassan virus, Rhinovirus, Legionella pneumophila, Pseudomonas aeruginosa, Salmonella bongori, Candida albicans & MRSA in less than 3 minutes as proven via independently derived in vitro, benchmark kill-time studies. ACS 200 Extra Strength is the only antimicrobial proven to kill Borrelia Bergdorferi, the Lymes Disease associated pathogen. When choosing an immune system support formula, efficacy and safety are the only two factors that truly matter. Without harming the gut flora ACS 200 Extra Strength provides fast and significant relief. 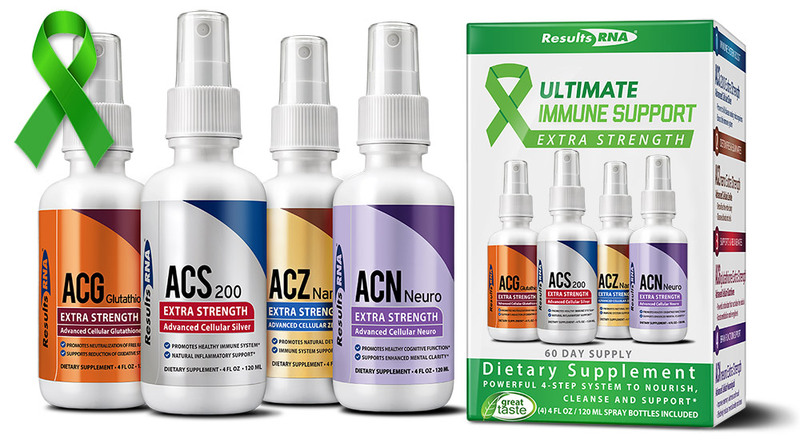 ACZ nano Extra Strength: Binds and Expels Toxic Heavy Metals, VOC s, Radioactive Toxins, Free Radicals and More. A powerful oral chelating agent, ACZ nano Extra Strength selectively and irreversibly binds and removes toxic heavy metals, such as Mercury and Lead, chemical toxins, VOC s, radioactive toxins and free radicals of all types through the urinary tract, without removing vital nutrients. These results have been verified in multiple, independent urine challenge studies. ACZ nano Extra Strength is the only detoxification product formulated to remove fluorine and chlorine, two of the strongest oxidizing agents known and found in most drinking water. As the most important intracellular antioxidant, GSH regulates all other antioxidants while preventing damage to important cellular components caused by reactive oxygen species, such as free radicals and peroxides. A major advancement in Glutathione supplementation, ACG Glutathione Extra Strength is an intra-oral spray GSH that tastes great and has been proven by independent clinical research to effectively increase intracellular levels of GSH by over 10% in only 7 hours. Neuro Care Extra Strength effectively reduces neurological manifestations associated with Lyme disease. Results are fast acting and safe.